I too obsess like you, never taking the “easy” way :-). I’ve been making vegitarian stuffed bell peppers lately that I developed for a vegitarian couple who visit and they seem to be quite a hit! In a bowl add the cooked quinoa, prepared black beans, small can of corn, shredded mozzarella cheese, Harissa spice, garlic, salt and pepper to taste. Depending on your vegetarians, you can add 2 eggs to help bind ingredients and to add protein. I cut my bells in half so they will lay on their sides and place cleaned halves into a large baking dish, fill them up with the quinoa mix and pour a jar of “Trader Giotto’s” Tomatoe Basil marinara on top (OMGosh, feeling guilty just writing that! 🙂 ) cover with foil and cook at 375 for 20 min. Then I remove foil and add more cheese to the top of each pepper and let it cook until slightly brown. Because these peppers are still slightly al dente instead of being over-cooked-to-death as some of us grew up with, they last in the fridge and are easy to heat up the next day. Of course you could also just do all prep and keep quinoa mix in the fridge until you’re ready to stuff and cook. Be prepared, they go fast. Thank you for the recipe, SWJ, and for your candor about brands, etc! Why is it that we feel guilty about such things, I wonder? I think most guests are happy to be invited, and come to be with other people – they don’t really care if the marinara sauce is from a jar, as long as we’re willing to tell the truth about contents if someone has an allergy. I wish you many happy dinners around your table, and many satisfied guests! 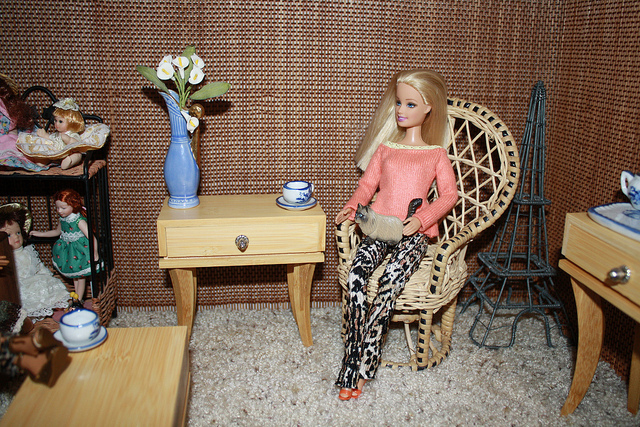 Btw, love, love, love Barbi and her beach house! While I’m not Jewish, I believe there’s much to be learned from this post. I too hesitate to invite people into our home when it’s less than perfect and really, does anyone have a perfect home everyday of the week. I often believe it’s spontaneous gatherings that are the most memorable of all because we don’t have pre-set expectations. That’s a great point, Sheri. One of my goals is to let go of as many of those pre-set expectations as I can, so that even the planned events can have that wonderful quality of fun. I read somewhere that if we were always cleaning and making things perfect, we would be too tired to enjoy our guest and in turn, we wouldn’t be at the top of our game and they wouldn’t enjoy our company as much as usual. I’ll be the first to admit my house needs a really deep cleaning, but neither is it a deep or disgusting dirty. A professor of mine once said to me, “Sheri, do you want it to say on your tombstone, her home was always spotless and she baked the best cookies in the world?” That may be the most important thing I learned! Next Next post: What is the Priestly Blessing?